The Caliber 47 Long-Range Cruiser combines the storage requirements of long ocean passages with the practical realities of coastal cruising and living aboard. Like many modern cruising boats, the 47 has a relatively shallow but long keel and a sturdy rudder/skeg combination aft. Hull construction is solid fiberglass with vinylester resin in the first layup, after the outer gelcoat, and GP polyester resin in the remaining laminates. The deck and cabin top are both cored with 3-inch squares of ¾-inch plywood for lightness and strength. The midship cockpit is ample, with a large steering pedestal in its center. The steering wheel is in front of the pedestal’s instrument pod, its spokes are curved aft, bringing the outer rim outside the pedestal and making the engine and instrument controls easily accessible without having to reach around, or over, the wheel. Below deck, the layout provides luxurious and comfortable accommodations for four people. The forward cabin has a head, a separate shower stall, and two spacious stowage lockers. The main saloon, which is amidships, has a large fold-down table with an L-Shaped settee to port, seating to starboard and a forward-facing nav station at the foot of the companionway to starboard. The master head (with shower) is immediately aft to starboard, just forward of the master stateroom. The long L-Shaped galley, with freezer and refrigerator, is in the portside walk-through to the master stateroom. The engine room, between the galley and owner’s head, is large and well laid out. Water and fuel controls and filters are grouped together and have back-up systems in case of clogs or failures. A sea chest handles all water intakes and requires only one through hull below the waterline. I have sailed a 47 on flat water in winds of 8 to 12 knots, with gust up to 18. In the puffs the boat heeled a little before accelerating, but weather helm was not excessive. The boat tracked well on all points of sail and was maneuverable under both sail and power. Most boats are compromises, but the Caliber 47LRC is built to go either to sea or harbor-to-harbor in comfort. What sets Caliber apart from the fleet of her rivals? Is it her swiftness? Her seaworthiness and durability? Her exceptional stability and comfort? As Caliber owners know, it is the artful combination of these qualities, which enables a Caliber to perform beyond the limits that constrain so many others. The Caliber 47 LRC meets all those expectations of a cruiser. The 47 LRC has features like Water Tight Collision Bulkhead, Water-Tight Rudder Dam, Flexible Fuel System, Safety Sea Chest, Convertible Cutter Rig, In mast furling, Generator, Watermaker, Solar Cells and much more. The current owners are extremely meticulous. Maintaining all the systems and the overall condition was a priority. The next owner will greatly benefit from their attention to detail. This Caliber 47LRC is worth an inspection. The Caliber 47 Long Range Cruiser is the definition of a true-blue water cruiser. Seaworthy and good looking! Of the 25 47 LRCs made, All are still on the water providing extraordinary safety and comfort for the owners. 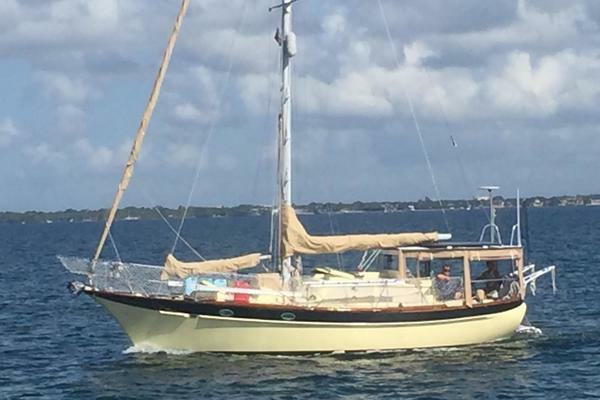 The added fuel and water capacities allow ease of travel and the large center cockpit layout and spacious interior allow for ease of living while the convertible cutter rig with in-mast furling mainsail allows for ease of sailing and the mast is only 63’ making BRAVEHEART intracoastal waterway friendly. BRAVEHEART has been meticulously maintained by her fastidious owner and has special upgrades and updates that distinguish her from the other Caliber 47s. A complete list is available from the listing broker. West Florida Yachts would love to guide you through a personal showing of this 47' Caliber LRC 1999. 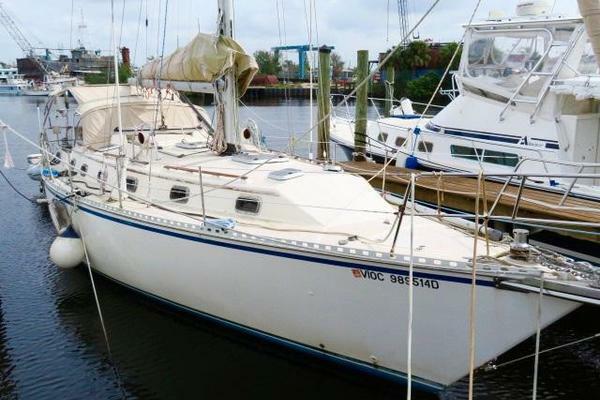 This yacht for sale is located in New Bern, North Carolina and priced at $229,900. For a showing please contact us by filling out the form on this page and we will get back to you shortly! The main salon takes full advantage of 6'6" headroom and a wide beam to provide an expansive living area. The bulkhead-mounted dining table folds up for even more floor space. The navigation station is positioned facing forward with plenty of cabinet space to accommodate a full range of electronic navigation equipment. There is a starboard settee and an L-Shaped settee to port covered in ultra-suede. The forward stateroom features a generous offset berth with adequate storage. There is a roomy head with separate shower stall enclosed by plexiglass doors. The aft cabin which is well separated from the main salon, offering an easily accessible island berth, cedar-lined hanging lockers and abundant storage. There is a washer/dryer installed in the starboard locker. The efficient galley is ideally situated for ease of cooking and entertaining. At the bow is a 7' long molded pulpit with twin stainless-steel anchor runners leading to the double anchor rollers. the runners are equipped with chain locks and a single plow anchor is present. The chain runners lead back to the anchor locker with chain and rode storage. A separate electric Lewmar windlass with foot switches is mounted for each anchor position. Two deck lockers are aft of the anchor locker and there are two 21" X 21" deck hatches (one on each side of the tabernacle mast and two 14 X 18" hatches further back). There is a total of 10 stainless steel ports around the boat. Aft of the cockpit are two deck access storage lockers with the port locker having the fuel tank and fuel gauge. On the stern walk through there are two additional storage lockers on each side of the stainless-steel boarding ladder. On top of the housetop is a cradle and suitcase inflatable life raft and on the starboard side of the mast is a stainless-steel mast gate. Also, on the housetop are two stainless steel dorades and port and starboard catbird seats plus a stern rail mounted outboard motor bracket. The galley provides a 10' long counter and plenty of storage for food and provisions and will please even the most discriminating chef. An extraordinary opportunity to purchase an up to date and ready to go Caliber 47 Long Range Cruiser. Maintained by a fastidious owner you can put your personal items onboard and go cruising!